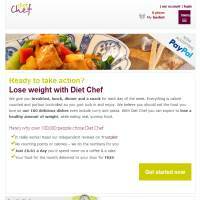 Diet Chef is a UK and US-based service which delivers healthy pre-prepared food to your door. There are more than 100 dishes to choose from, and delivery is free. Cuisines range from American to Chinese, Indian and more, allowing you to enjoy the foods you already love, and to try foods you’ve not yet encountered. The real pull factor of DietChef is twofold: firstly, there are no complex recipes to follow, the food is simply delivered and you reheat it. Secondly, there’s no calorie counting involved. You just follow the basic outline of 3 set meals and a snack, and watch the weight fall off. Unfortunately, you still need to do the washing up, but at least there won’t be piles of pots and pans. The fact that you can eat 3 meals and a snack, and still lose weight, makes Diet Chef’s service very attractive. What’s more, it’s actually very affordable. Some similar services cost around $50 a day, whereas Diet Chef is around $7-8 per day. It’s no wonder, therefore, that more than 100,000 people choose to use Diet Chef. At the time of this review, they also provide a free set of Salter scales if you take out an 8 week diet plan. Whilst the site offers a pretty reasonable service for a good price, it doesn’t do a whole lot else. There’s a BMI calculator, but not much information about exercise or healthy eating more generally. It doesn’t even go into much detail about the meals, rather just lists them with a brief description. Therefore, if you did want to check on sugar levels, fibre and so on, this isn’t easy to do before receiving your packages. If you have particular dietary requirements, we recommend speaking with a member of the team using their live chat feature, to make sure these are catered for. DietChef.com and DietChef.co.uk would really benefit from a few more online options to help people decide on what to eat. For example, allowing users to leave comments about each meal would mean that members can make more informed decisions about what they want to eat. A forum or at least a few resources for exercise tips or eating out tips would also be useful. If you want healthy foods delivered to your door, with a decent range to choose from and no delivery fees, DietChef is worth checking out. The site is a bit lacking in information and features, but the basic premise seems successful.